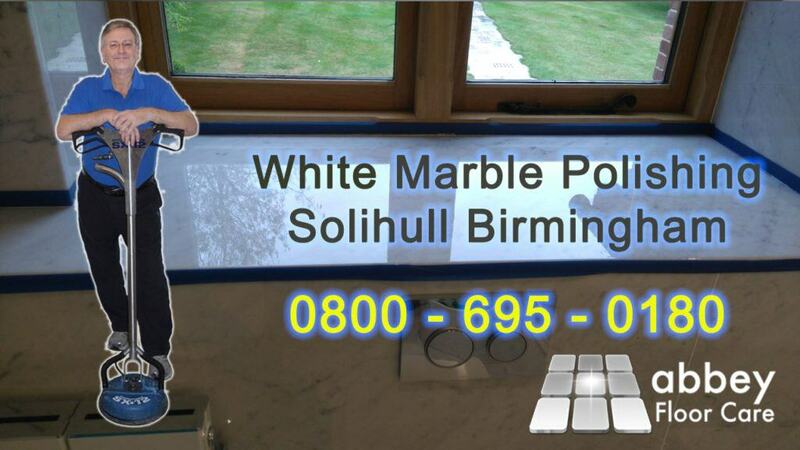 Hello this is Abbey Floor Care and we are near Solihull, Birmingham restoring a marble windowsill and a white marble vanity unit. On the windowsill there were three areas where the sill has been heavily abraded during installation. There were also surface scratches and some etch marks from soap and product containers. The vanity unit had etch marks from soap and product containers. The abrasions could be honed and polished, however owing to the depth of the damage we recommended that the majority of the sill was re-ground and polished to give the surface an even appearance. Applying an impregnating sealer will help protect the marble from splashes and spills, but it will not protect it from acidic splashes and spills. As the windowsill is in a bathroom it is highly likely it will be damaged in the future from acidic liquid soap spills. So we recommended applying a new acid resistant surface sealer totally protects marble against acid spills for a period of two to five years. Our customer decided on the acid resistant protection. We started by installing protective plastic sheeting on the ground floor, over the staircase, landing and into the bathroom to protect it from soiling as we went to and from the work area. We also installed protective sheeting to the surrounding walls, and floor, to protect them from splashes and spills from the work area. We started by honing the abrasion marks,scratches and etch marks starting with 100 grit diamond pads. We continued through the grits, finishing with 3,000 grit to confirm the final finish. We then abraded the whole finish to a 2,500 grit to provide a key for the acid resistant sealer. The sealer was carefully applied to the windowsill and left to 30 minutes to cure to a hard finish. We followed the same procedure in laying down protection o the carpets leading the the second bathroom and protecting the walls and floor around the marble vanity unit. The we followed the same procedure as with the windowsill to remove the etch marks, prepare the marble vanity unit for sealing and applying the acid resistant sealer. Our client was advised of the importance not to put anything back on the windowsill and the vanity unit for the next 72 hours as the sealer needs that time to fully cure. A surface sealer does not give the deep lustrous gloss that you get with powder polishing. Nut the finish is still a beautiful high gloss and it is now resistant to acid spills, so no more ugly etch marks. If you would like your marble or any other kind of stone floor restoring to a beautiful finish call Abbey on 0800 695 0180 or complete our simple contact form on www.abbeyfloorcare.co.uk.